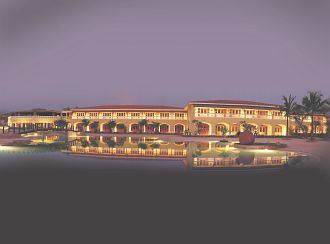 Opulence characterises this 5 Star resort, tucked between the Sahyadhris and the Talpone River. Amidst 85 acres of verdant land and built in a quaint Baroque-Portuguese style twin-story structure, it comprises 255 luxurious suites with arched corridors. There are six dining options, including an open kitchen and a sunken bar, a formal meeting space, a Double T 9-hole golf course, a shopping arcade, indoor game rooms, a beauty salon, and even a yatch to sail, and discover new destinations.